Welcome to the first of several postings about the most amazing reunion in the history of reunions. Given that it involved the event itself (a two-parter that included an afternoon and evening/dinner segment), a 1,500 mile sister road trip in which no eyeballs were scratched out, and many stops along the way (about which more when it is time, which it is not yet), it is worthy of more than a single post. 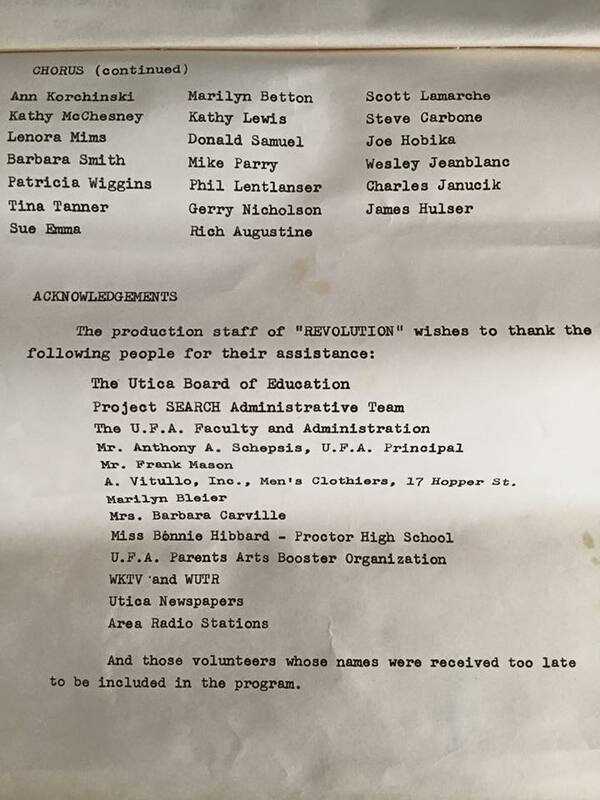 Back in January, I wrote about co-chairing an upcoming summer reunion of my high school performing arts department. 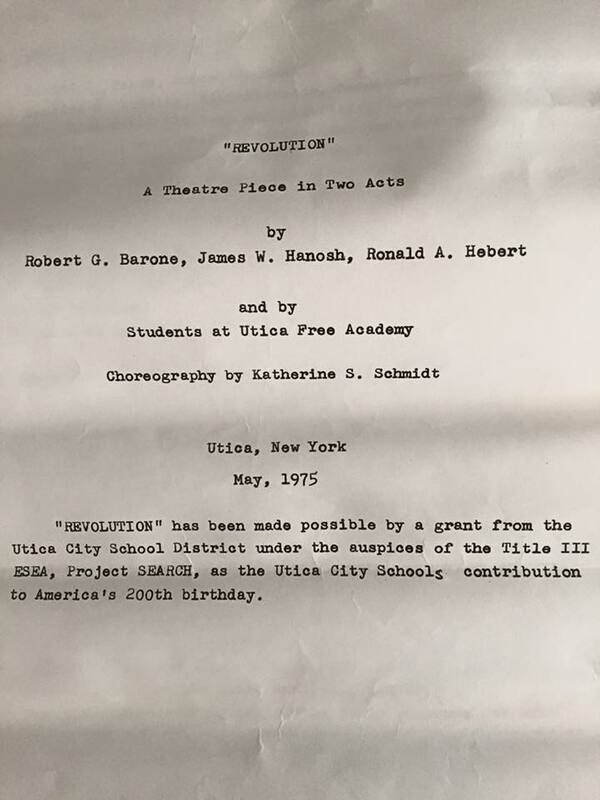 We were getting together to celebrate the 40th anniversary of the original theater piece we wrote – from scratch – to commemorate the US Bicentennial. We were dumb high school kids who had no clue we were doing anything remarkable. 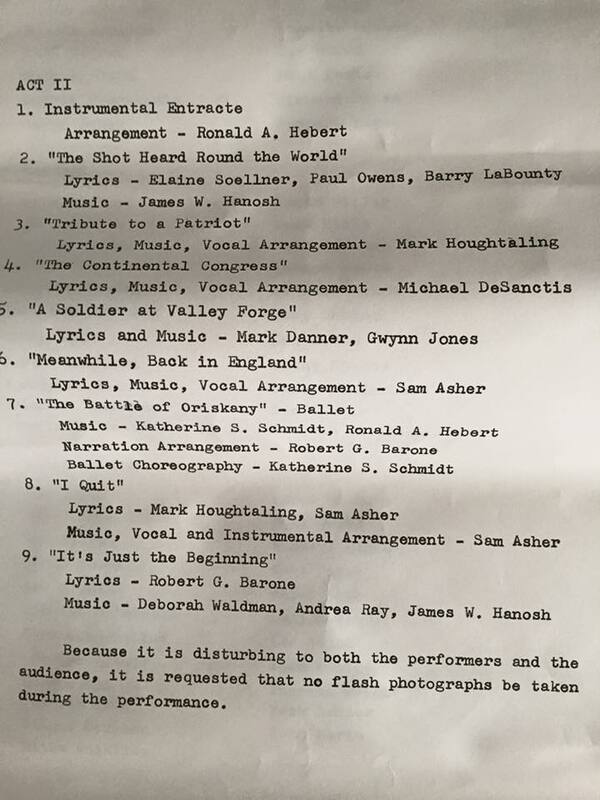 And we were way too dumb to understand or appreciate that the teachers who’d decided a bunch of dumb high school kids could write and perform an original theater piece were several notches above remarkable. Unusual, yes. That much we knew. Returning to school after dinner on a weekly basis to hang around in the orchestra room wasn’t something friends in other high schools were doing. But it felt perfectly normal, once we got there on Wednesday nights, to noodle around inventing songs and grabbing classmates, or Mr. Hebert, when we hit on something we thought was interesting enough to share. Meanwhile, over in the choir room, other students were singing melodies to Mr. Hanosh, who’d write them down and send them over to Mr. Hebert. Downstairs in the theater, they were writing narrative pieces with Mr. Barone, who taught English and ran the theater program. 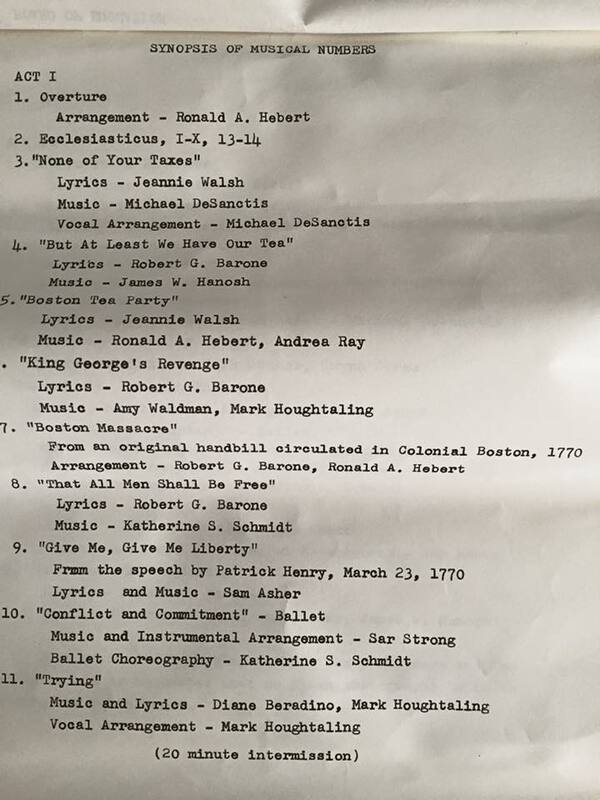 Once there were actual songs, Mrs. Schmidt, the dance teacher, began collaborating with her students on choreography. The cover for the program for our first performances. Brace yourself. There are a lot of pages here. 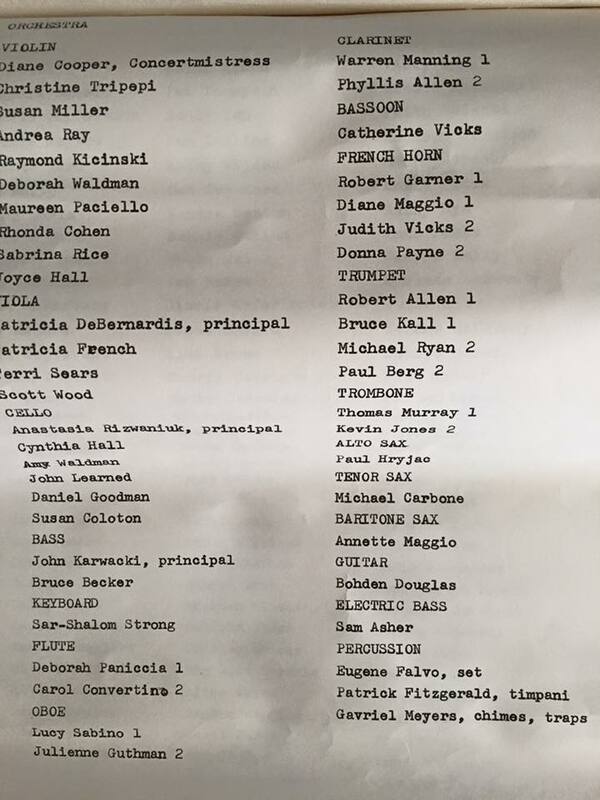 Program – Page 3. It might be a good idea for some of the the policymakers who think arts education is a “frill” to read this. Trust me, there is at least one future post on this topic. The choral roster goes on forever!!!! (Turns out there were five choirs at our high school. Who knew?!) 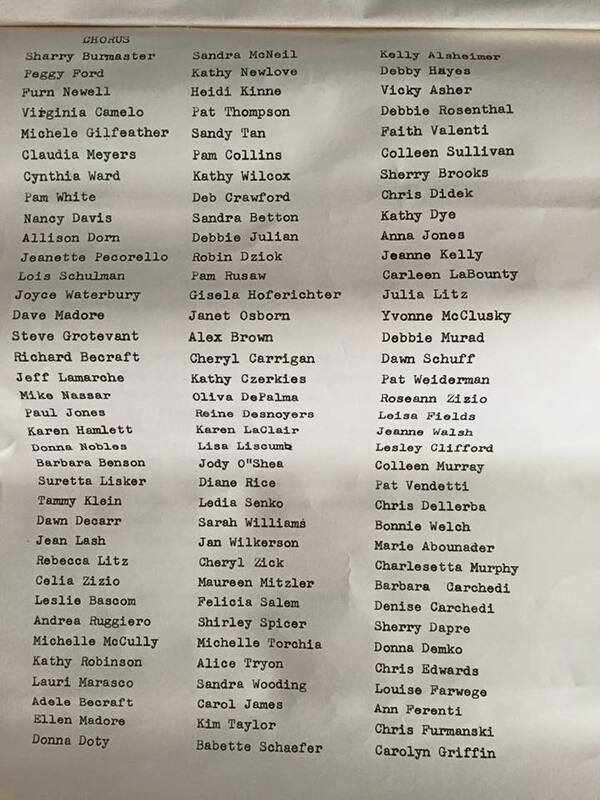 Also, there were too many names to fit on one page. The rest of the choristers’ names, and the acknowledgements. We had no idea we were doing anything remarkable. But when you look at this, it makes you think…..
Fast forward 39 years. “Revolution” might have seemed too far back to be visible in anyone’s rear-view mirror. But that line about objects being closer than they appear? Turns out, at least in this case, to have been spot-on. As a Facebook newbie in 2014, Bob (formerly known as Mr. Barone) posted the idea of an event where we could come together, drink some wine and listen to the music together. Another classmate started a reunion group and within a day, membership exceeded 200. Bob’s reunion idea had sprouted legs, and the race was on. 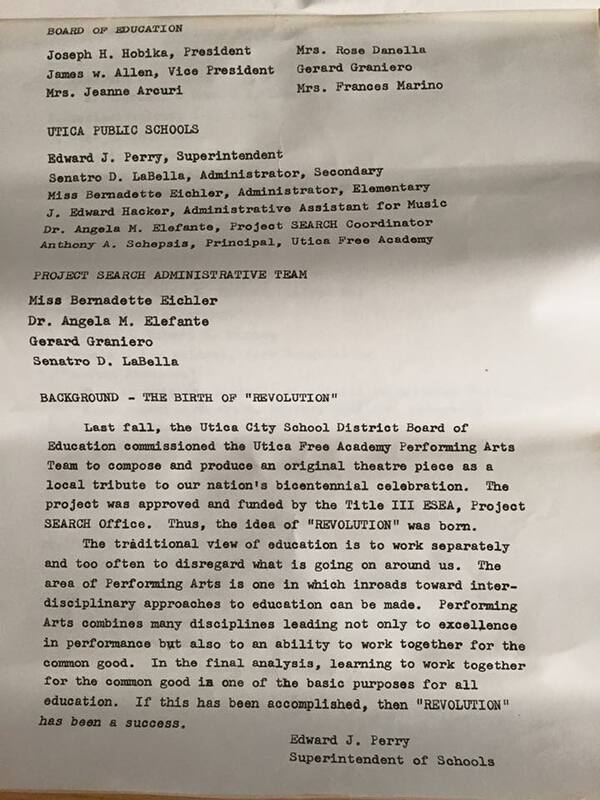 The core planning committee (John and Jeannie and I) came together in August of 2014, and followed a process that closely mirrored the one used to create the original piece (minus the teacher-written Project Search Grant that funded the 1975 production). 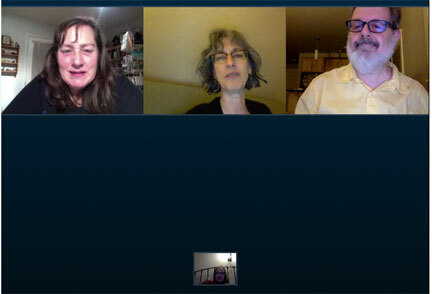 We all lived in different time zones, so we met over Skype and JoinMe. This is a remarkably unflattering photo of all of us, but it was taken during an actual committee meeting in January. And yes, that is me in bed (bottom). This is, in part, what I wrote back in January when I thought (and wrote) that the best part of the reunion had already happened. It turned out that that best part was the preamble to a whole lot more best parts. By the time my sister and I arrived at Player’s Theater, other Committee members (we expanded our planning group based on evolving needs, at which point we’d reach out to other classmates based on their skill sets and proximity – and I’d also done my best to drag my sister into the planning process early on – she attended a couple of meetings and was a setup star) were hard at work. 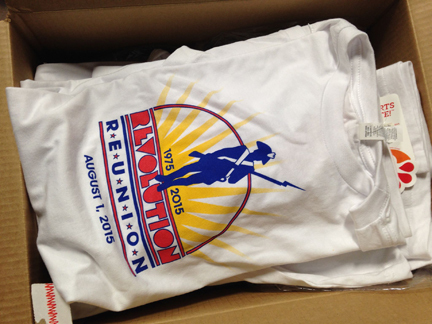 Jessica, who designed the reunion T-shirt based on Michael’s original logo design, was putting tape on the back of posters decorated with the reunion logo. Jeannie was setting up the screen and projector she’d borrowed from the library where she works, and John was setting up small round tables. 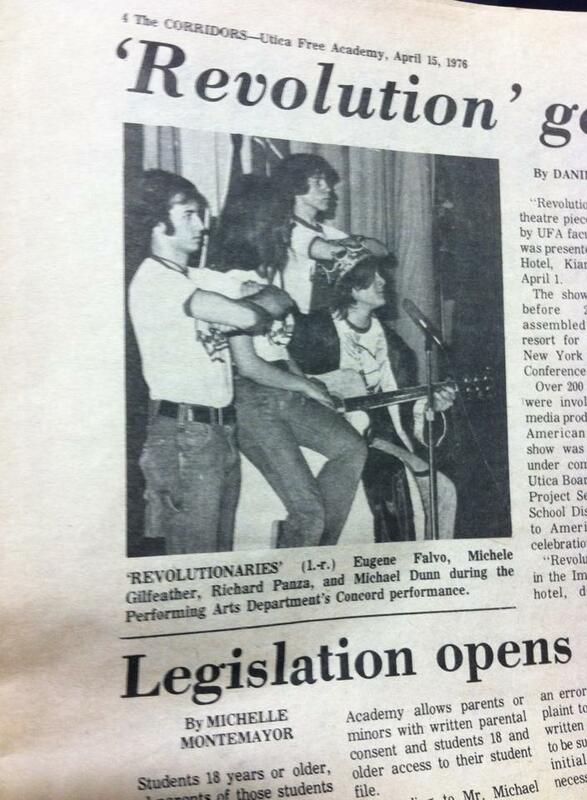 The T-shirts Jessica designed, riffing off of the one Michael designed (gulp) 40 years ago. You can see the original design on the program cover above. 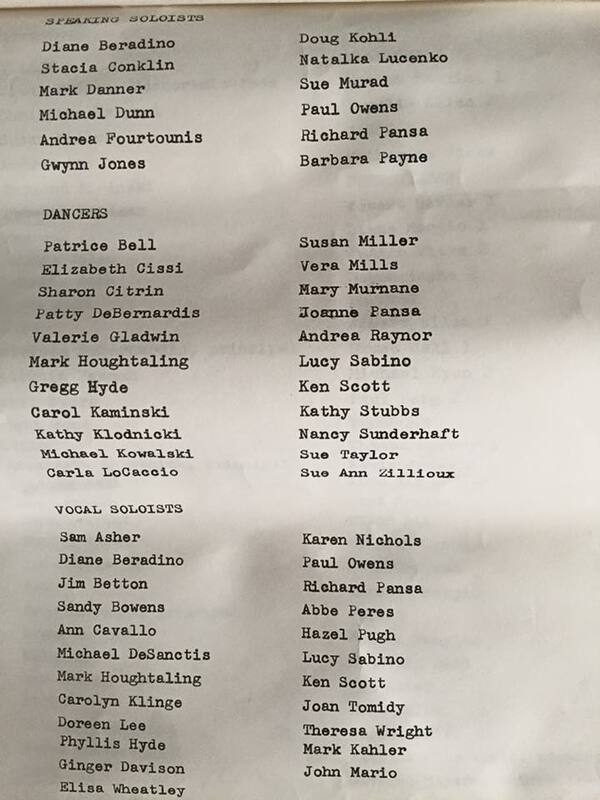 I plopped myself down at one end of a table and continued working on the reunion playlist after having emptied the portfolio of memorabilia I’d hauled along – newspaper articles, two two-album cast recordings – one of the original production and one of the piece we’d done the year before (“Truth of Truths”), both signed on the inside, of course, by castmates and teachers. Debby (my sister, who graduated a year behind me and played violin in the orchestra) still had her T-shirts from both performances. Everyone else had their memorabilia, but Debby was the only one with two T-shirts. She took Jessica’s posters and the loose news stories and pictures and started setting up displays around the room. One of the loose news stories Debby placed around the room. The guy on the left, Gene, and Michelle were both at the Reunion. The others were missed! Bob showed up with a box. 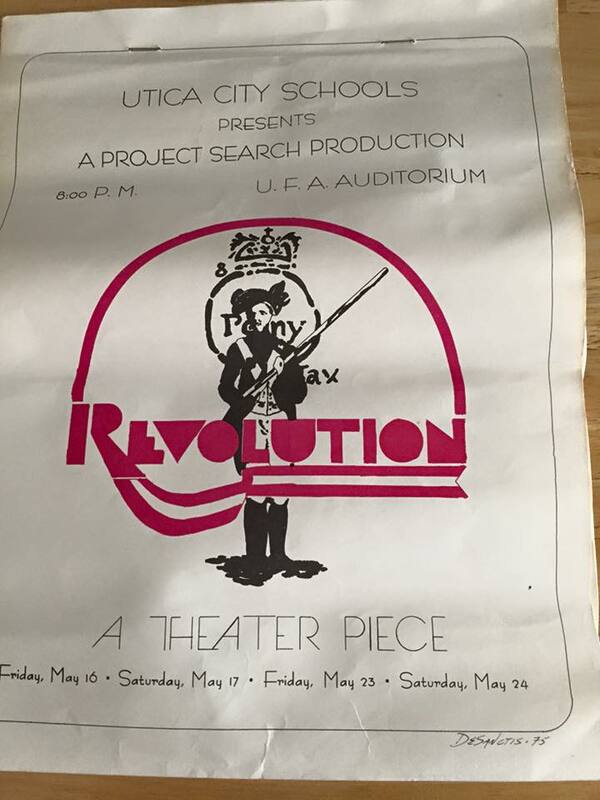 He began hanging banners and posters from other high school productions, and the drama group banner. He hauled in a display board with newspaper clippings. 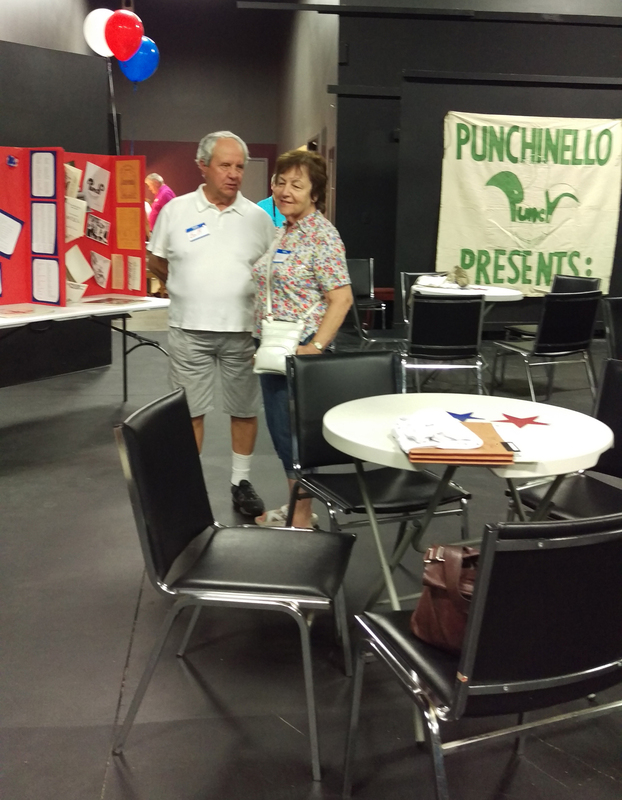 Bob and his wife Audrey, with the drama group banner in back of them and the display boards to their left. Before it was all over, Suzi had stopped by to say hello, (she’d done all the heavy lifting for the Saturday dinner that followed the afternoon event) and two Michaels – one the original logo designer and the other a sax player who’d become a high school music teacher. We’d tapped the latter Mike to co-emcee the formal part of the Saturday program along with Patty, because they both became high school music educators. But his band was playing a wedding they’d booked more than a year prior, so Patty was doing a solo act. Mike was so crushed about having to miss the Saturday event that he made the four-hour round-trip drive from Binghamton to help out with setting up. It was so amazing to see him, and to catch up on everything we’d been doing since we last saw each other….sometime in, oooh….the mid 1970s. As we were leaving Player’s to head over to Gerber’s for what turned out to be a fabulous dinner, he walked over to his car, lifted the tailgate, reached in and grabbed something. Then he walked over and started handing us each copies of his jazz combo’s recent CD. YOU KNOW how Much that Weekend ment to me seeing you was the BEST and Debby and Adel and everyone else it Amazes me that after 40 years ALL our dear Teachers can tell us all to Sing and with out a word from any of us we do ! Previous Previous post: An Open letter to United Airlines, with a Postscript to Southwest: The skies were friendly, the ground – not so much.